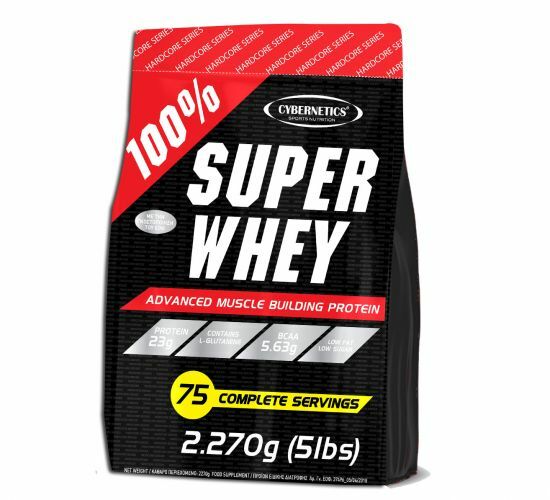 Cybernetics's SUPER WHEY has a high whey protein content that is the essential building block for muscle cell reconstruction and synthesis. To build muscle tissue the human organism should be in a positive nitrogen balance and this means that the intake of protein must be more than that consumed by our body in our day-to-day activity. Especially for those who exercise vigorously, protein should be the basic ingredient of everyday nutrition. SUPER WHEY contains all the essential elements the human body needs to be able to synthesize muscle tissue. Each dose of SUPER WHEY contains only 1.4 gms of saturated fat and minimal sugars (2 g). At the same time, it contains 23 gms of whey alone and 5.63 branched chain amino acids (BCAAs), the most important amino acids for muscle cell production. Give your organization the essential elements it needs to grow. Use SUPER WHEY from Cybernetics.